Surrounded by Montreal’s downtown city blocks is Mont-Royal, the mountain which gives the city it’s name. It’s called a mountain, but it’s more of a large hill or public park, and reaching the top isn’t really hard work. Nevertheless, from many of the main streets below it rises into view, and it’s humbling presence reminds you that Montreal is quite small, and that the natural world is right on the doorstep. Winter boots. Check. I climbed Mont-Royal for the first time in mid-January. It was the dead of winter and the snow was knee-deep. The weather was cold and I felt stuck inside, and as a result I needed to stretch my legs and shake off the cabin fever. 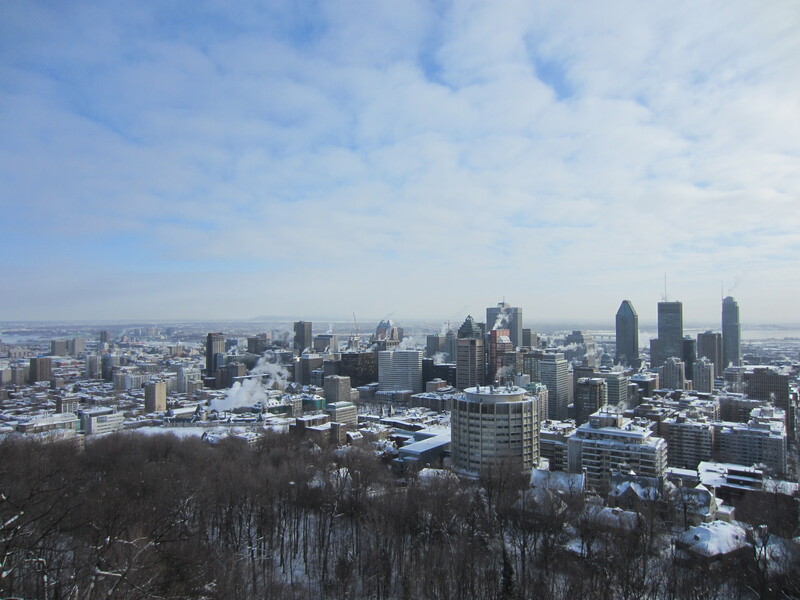 Plus, I wanted to check out Montreal from it’s highest viewpoint. From the mountain’s base, it didn’t look like much – just a forest of gnarled brown trees sprouting out of the snow. 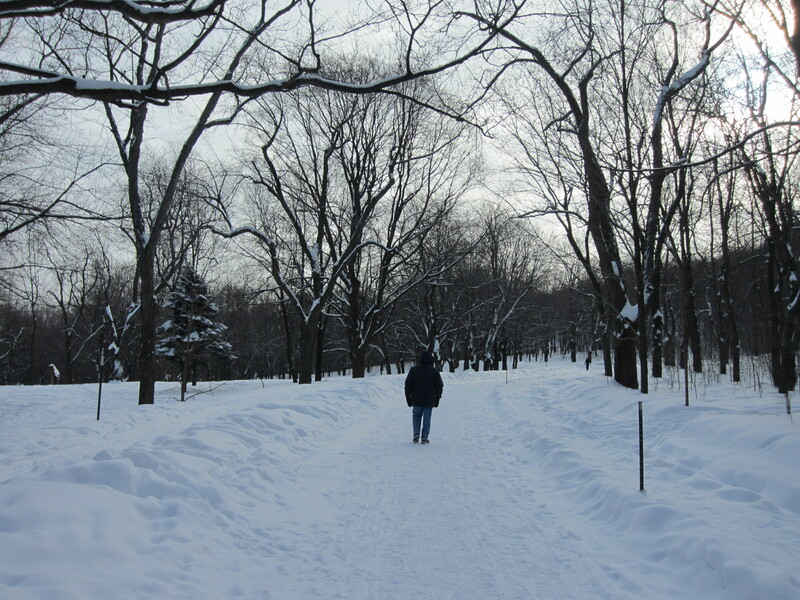 I approached from Avenue du Mont-Royal, taking the Olmsted trail the long way round, searching for the stairs. Near Avenue du Parc, families watched their youngest and bravest barrel down the snowy hill on plastic toboggans. Cross-country skiers were shuffling about in laboured procession of poles, skis and goggles. Winter wildlife was abound too; tiny birds hovered around wooden feeding platforms, whilst on the ground, squirrels tumbled and somersaulted in playful pursuit. The classic viewpoint is from le Chalet du Mont Royal, which can be reached (if you come from Rue Peel or somewhere downtown) by the zig-zag of gruelling wooden stairs. Once there, the panoramic platform treats you to a few lungs of crisp fresh air, and a view of the Saint-Laurent river, business district, Rue Saint-Catherine and McGill University, with it’s beautiful Hogwarts-esque conical roof spires. On a cold day, steam can be seen rising from dozens of buildings. A trail loops around the top of the mountain, taking you past a huge steel cross. In summer the mountain transforms as it undergoes a metamorphosis from a quiet, mysterious world of snow into a bustling outdoor activity park. The grass (which somehow survived through the cold) returns to colour, and the trees slowly follow suit. 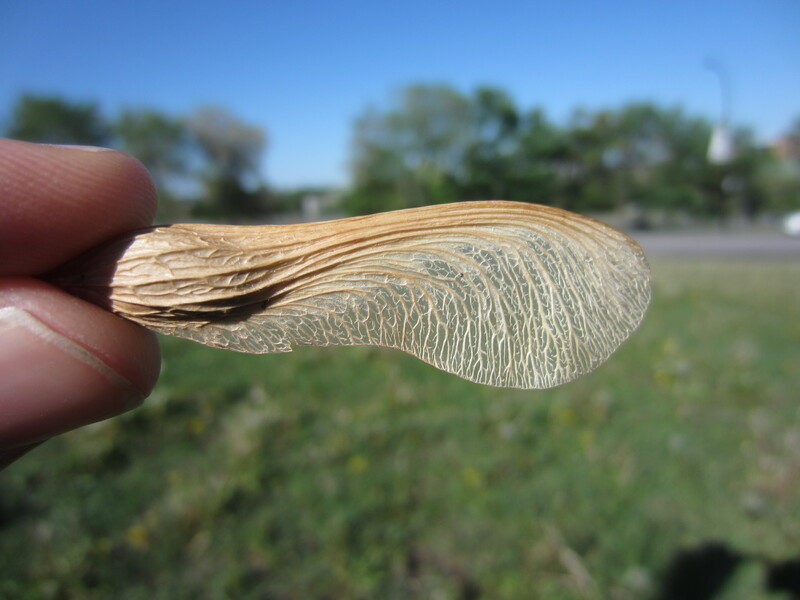 Pollen fills the air (to the distress of my hayfever allergies), and seed pods whirl and helicopter through the air. It becomes a place for dog walkers and dedicated uphill joggers, as well as drummers, mock-knights, pot-smokers, and tightrope-walkers. Whilst sitting down by man-made Beaver Lake, Cindy and I spotted a rollerblader spectacularly crash into a park bench. Mont-Royal is a nice day trip for a visitor with limited time, but also a cool place to just hang out on a Sunday.